After Illinois achieved statehood, new settlers poured into central Illinois throughout the 1820s, making new homes for themselves in and around Fort Clark (Peoria) or clearing land for farms along the eastern shores and bluffs of Peoria Lake and the Mackinaw River basin. Those were the years that saw the arrival of Tazewell County pioneers William Blanchard, Nathan Dillon, and William Holland. Another of those early settlers was an Ohio resident named Jonathan Tharp (1794-1844), who built a log cabin on a ridge above the Illinois River in 1824 at a spot that is today the foot of Broadway in Pekin. Tharp’s cabin was the seed that would sound sprout and grow into the city of Pekin. The result of the wave of immigration of those years was that in 1825, a mere seven years after statehood, the State Legislature erected a new county, named for the Peoria tribe of the Illiniwek who had once dwelt in that place. 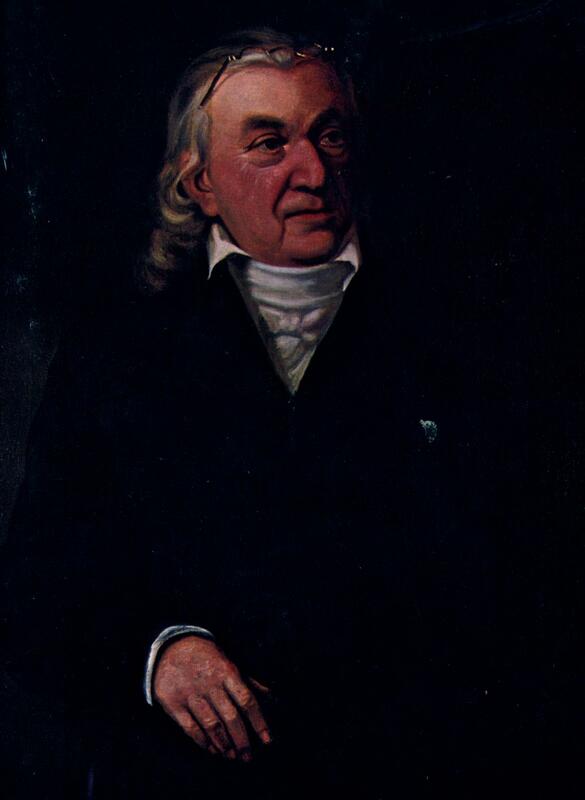 Tazewell County came along almost on the heels of Peoria County’s founding. As we have often recalled in this column, Tazewell County was established in 1827. It was Illinois’ 38th county – the 23rd county since statehood. At the time, Tazewell County was officially a part of Sangamon County, but was in fact under the governmental administration of Peoria County. 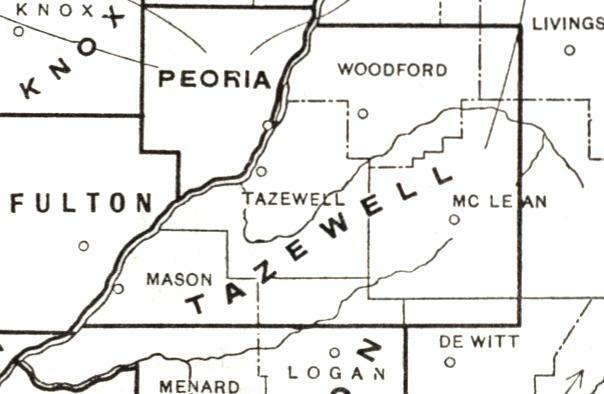 This detail from a map printed in the State of Illinois’ 1991 booklet, “Origin and Evolution of Illinois Counties,” shows the original boundaries of Tazewell County as established by the State Legislature in 1827 and 1829. The village of Mackinaw was chosen as the first county seat because it was then near the geographical center of the county. The original plan was to name the new county “Mackinaw,” after the tributary of the Illinois River that flowed through it (a Kickapoo chief named Mackinaw or Machina also lived with his people in Tazewell County in those years). However, one of the county’s prominent pioneers, Gideon H. Rupert (1799-1877), a Virginia native, intervened to have the proposed bill to establish the county amended, so the new county would instead be named for U.S. Senator Littleton W. Tazewell of Virginia. The first county seat was still named Mackinaw, though. “Tazewell county was organized by an act of the Legislature January 31st, 1827, with the following boundaries: Beginning at the northeast corner of township twenty, north of the base line, and range three east of the third principal meridian, thence north on said line to the north line of township twenty-eight north, thence west to the middle of the Illinois river, thence down said river to the north line of township twenty north, thence east to the place of beginning. “In the act organizing the county January 31, 1827, an error occurred in describing the boundaries. This error was corrected by an act re-establishing the boundaries, passed January 22, 1829. “1809 — At this date Illinois Territory was organized, and was subdivided into the counties of Randolph and St. Clair. Tazewell was included in the county of St. Clair. “1812 — Tazewell formed part of the county of Madison. “1814 — Tazewell was included in the counties of Madison and Edwards: west of the third principal meridian in Madison, east of the meridian in Edwards. “1816 — Tazewell was included within the boundaries of Madison and Crawford counties: east of the meridian in Crawford, west in Madison. “1817 — Tazewell formed part of the counties of Bond and Crawford: west of the meridian in Bond, east in Crawford. “1819 — Tazewell was included in Clark and Bond counties: west of the meridian in Bond, east in Clark. “1821 — Tazewell formed part of Fayette and Sangamon counties: west of the meridian in Sangamon, east in Fayette. “1827 — Tazewell organized January 31st: boundary defective. west of the third principal meridian taken from Sangamon, east of the meridian, comprising 24 townships, taken from Fayette. “1830 — McLean county was formed by taking off the three ranges east of the meridian and range one west of the meridian. “1839 — Logan county was created, taking off three townships on the south. “1841 — The counties of Mason and Woodford were organized, and Tazewell reduced to its present boundaries. “The commissioners to locate the county seat were Thos. M. Neale, Wm. L. D. Ewing and Job Fletcher. They were by the act of organization required to meet on the third Monday of March, 1827, or within five days thereafter, at the house of Wm. Orendorff, for the purpose of locating the county seat, which, when located, was to be called ‘Mackinaw.’ Until county buildings were erected the courts were required to be held at the house of Wm. Orendorff. Election for county officers at the house of said Wm. Orendorff on the second Monday of April, 1827. “All that part of Fayette lying east and north of Tazewell was attached to Tazewell for county purposes. “In the year 1825 the Legislature created Peoria county, and attached to it for all county purposes all of the territory north of town 20 and west of the third principal meridian, thus including all the present county of Tazewell. Nathan Dillon, William Holland and Joseph Smith were chosen County Commissioners for the new county. The former two resided in this county. They held their first meeting at Peoria March 8, 1825. “When the population of Tazewell was thought to be sufficiently large to regularly organize, an election was held in April, 1827, and Benjamin Briggs, George Hittle, and James Lotta were chosen County Commissioners. The Commissioners at once proceeded to hold a meeting and consummate the organization. This they did at the house of William Orendorff, April 10, 1827. . . .
“The county at this time was very large; even in 1829, when a new boundary was formed, it contained 79 townships. It has been divided for the formation of other counties so often that it has finally been reduced to 19 townships. All available records indicate that when the founders of Pekin gave their town its name in 1830, they had in mind the renowned Chinese city of Peking (Beijing). Their new settlement on the east bank of the Illinois River would soon become the seat of government of Tazewell County, which had been established in 1827. But why was the county given the name “Tazewell”? Tazewell County in Illinois was named for U.S. Senator Littleton Waller Tazewell of Virginia, depicted here in a portrait in the collection of the Library of Virginia in Richmond. The portrait is reproduced on the cover of Norma Lois Peterson’s 1983 biography of Senator Littleton. In this column, we have previously noted that originally, when Illinois legislators made plans to form a new county out of Peoria County, the proposed name was Mackinaw County, not Tazewell County. In fact, the bill that was approved by the Illinois House of Representatives in January 1827 was named, “An Act Creating Mackinaw County.” The Illinois Senate, however, amended the title to read, “An Act Creating Tazewell County,” and it was in that form that the bill passed the Senate on Jan. 31, 1827. It was Pekin pioneer settler Gideon Henkel Rupert (1799-1877), who soon after his arrival in the future Tazewell County was able to become a successful businessman and landowner – and the wealthiest man in Pekin – who is credited with convincing the Illinois Senate to name the new county after Senator Tazewell of Virginia. Littleton W. Tazewell had no connection with the county that was to be named after him, so why would Rupert want his county named for Tazewell rather than bear a local Native American place name such as “Mackinaw”? It probably had something to do with the fact that both Rupert and Tazewell were Virginians. Rupert was born in New Markey in Shenandoah County, Virginia. Tazewell was one of the most prominent Virginians of his day, and a renowned and admired speaker whose oratorical skills rivaled those of his fellow U.S. Senator Daniel Webster, so it was probably pride in his native state that explains Rupert’s desire to see the new county named for Senator Tazewell. A copy of Norma Lois Peterson’s 311-page biography of Tazewell County’s namesake Littleton Waller Tazewell, published in 1983, recently was graciously donated by the Tazewell County Genealogical & Historical Society to the library’s Local History Room collection. Here’s a chance to read again one of our old Local History Room columns, first published in November 2013 before the launch of this blog . . . The village of Mackinaw in eastern Tazewell County occupies a special position in the county’s history. As this column has noted previously, Mackinaw was the first seat of government for Tazewell County, and the first county courthouse was erected in Mackinaw. One of the most important sources for the history of those days is Charles C. Chapman’s “History of Tazewell County.” Also among the Pekin Public Library’s Local History Room sources that tell of Mackinaw’s history is “Mackinaw Remembers 1827-1977,” edited by Gladys Garst. The story of Mackinaw’s founding is told on the first two pages of that book, along with a glance back at the prehistory of the Mackinaw area. The most obvious marks of Mackinaw’s Indian cultural heritage are the village’s name and the name of the Mackinaw River. As a rule, the names of rivers and notable natural geographical features tend to be older than the names of towns or cities. Naturally that is the case with the village of Mackinaw. It may be a surprise to learn, however, that the village did not derive its name from the river. Chapman’s Tazewell County history also includes some anecdotes of Chief Mackinaw, or “Old Machina” as Chapman calls him, and notes that his people, the Kickapoo, “dwell in the western and southwestern part of the county” (page 195). “For some years after the first settlers came wigwams were scattered here and there over the county . . . Another extensive camping ground was on the Mackinaw river, near the present town of Mackinaw. Old Machina was the chief of this band. The Kickapoos had made a treaty shortly previous to the coming of the first settler, by which the whites acquired all their land. When the whites came, however, to settle and occupy the land the Kickapoos were angry, and some of them felt disposed to insult and annoy the settlers. When John Hendrix came to Blooming Grove the Indians ordered him to leave. Not long afterwards they frightened away a family which settled on the Mackinaw. Old Machina ordered one family away by throwing leaves in the air. This was to let the bootanas (white men) know that they must not be found in the country when the leaves of autumn should fall. In 1823, when the Orendorffs came, Old Machina had learned to speak a little English. He came to Thomas Orendorff and with a majestic wave of his hand said: ‘Too much come back, white man: t’other side Sangamon’” (page 195-196). Fanny Herndon, one of the “Snowbirds” (the survivors of “the Deep Snow” during the extremely harsh winter of 1830-31), “related stories of earlier settlers mentioning the many tepees here. She told of an Indian trail which came in the village [of Mackinaw] from the northeast, went past the west side of the Bryan Zehr place, and led to the present home of Clifford Rowell. It continued southwest along the bluffs. The formal founding of the village of Mackinaw is almost coeval with the establishment of Tazewell County in 1827. Originally when Illinois legislators made plans to form a new county out of Peoria County, the proposed name was Mackinaw County, not Tazewell County. In fact, the bill that was approved by the Illinois House of Representative in January 1827 was named, “An Act Creating Mackinaw County.” The Illinois Senate, however, amended the title to read, “An Act Creating Tazewell County,” and it was in that form that the bill passed the Senate on Jan. 31, 1827. Gideon Rupert of Pekin is credited with the choice to name the county after Rupert’s fellow Virginian Littleton Waller Tazewell, U.S. Senator from Virginia. The legislation erecting Tazewell County also fixed the county seat at Mackinaw, which then was near the center of the county. William H. Hodges, County Surveyor, was hired to lay off the town of Mackinaw, and the sale of town lots was then advertised for three weeks in the Sangamon Spectator. It was decided that the county court house – a relatively simply log structure –was to be built “at or near the spot where the commissioners drove down a stake, standing nine paces in a northeastern direction from a white oak blazed on the northeastern side.” That was Lot 1, Block 11, where the Eddy Smith family lived in 1977. The Mackinaw courthouse served the county for only three years, from 1828 to 1831. Then followed the rivalry between Pekin and Tremont for the honor of county seat which this column has previous described. 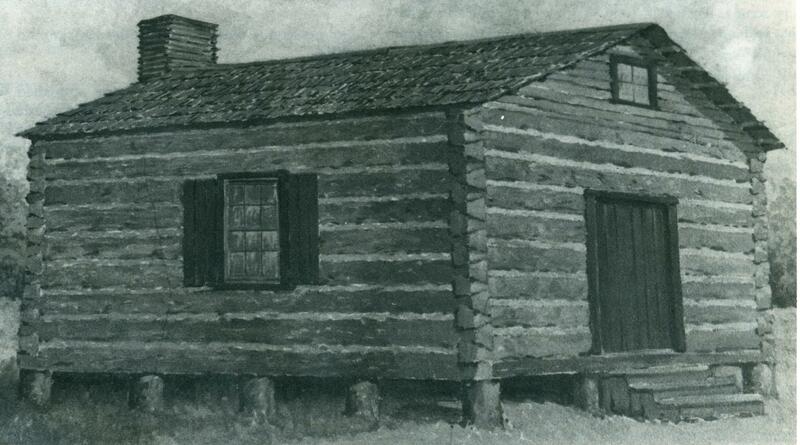 Shown is an artist’s rendering of the log house that served as Tazewell County’s courthouse when Mackinaw was the county seat from 1828 to 1831.